Having regular family meals is important for fostering close, warm, and healthy family relationships. Family dinners are especially important for creating a tight-knit family. Families that go out to eat are often very happy, but home-cooked dinners are usually the best for keeping the family happy and together around the kitchen table eating freshly made food. When cooking at home, you have a better choice for what you make, and with plenty of recipes to choose from, it’s easier to give your family, and your children, especially what they want. However, as your kids most likely prefer eating out at fast-food restaurants or enjoying less-healthy, nourishing foods, it may be difficult to keep them happy and full with healthy and nutritious foods. Dinners at home give you the ability to cook healthier dishes for your kids, rather than giving into their demands to eat out at restaurants, especially fast-food places that usually serve high-calorie, high-fat dishes. Cooking an awesome, healthy meal at home is most certainly the way to go if you want your children to grow up healthy and strong and be more immune to getting sick. However, if you’re new to healthy-home-cooking, you may have no idea what kind of recipes to use. To get you started, here are some healthy dinner ideas that you can make quite easily, and are sure to make your kids want more! While these delicious chicken fingers may fool you into thinking that you’re preparing classic fried tenders, you’ll be surprised to know that you’re really making a new kind of chicken to enjoy from a unique recipe. 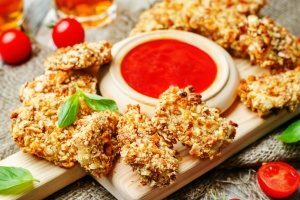 Instead of using fried batter, almond-crusted chicken fingers are the new, healthy alternative to the classic fried recipe, but don’t sacrifice any of the great taste! Almond-crusted chicken fingers are coated with a finely chopped almond, paprika, flour, garlic powder, dry mustard, salt, and pepper mixture. To get the mixture to stick, coat the chicken tenders in egg whites before coating them with the mixture and then bake them until golden brown. Next, just sit back and relax as you watch your kids eat one of their newly introduced healthy dinner ideas! Warning, this recipe does contain nuts, so this might be off-limits if either you or other members of your family have a nut allergy. Imagine a hamburger, but substitute the bun and the patty for a finely mixed hamburger mixture with pasta. This is what I like to call “Hamburger Buddy,” a delicious replacement for a high-fat, high-calorie classic hamburger. To start cooking, prepare a blend of garlic, carrots, mushrooms, and onions in a food processor until all the ingredients are finely chopped. Next, cook the beef in a large skillet until brown, making sure that none of the beef is left raw and pink. The next step is to add in the mixture to the meat in the skillet and stir until the vegetables are soft. Add in the pasta, water, some beef broth, and Worcestershire sauce and boil the ingredients until the pasta is soft. Make sure to keep stirring the beef for a few minutes. Then whisk flour into the rest of the beef broth and pour this mixture, along with some sour cream into the skillet. Finally, keep simmering and stirring often until the sauce has thickened. And there you go, a hamburger buddy that your kids will love that goes along great with the other healthy dinner ideas! You’ve might have heard of popcorn chicken and popcorn shrimp, but have you ever heard of popcorn cauliflower? Probably not, right? 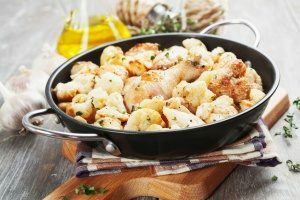 This unique and healthy dinner will have you and your kids surprised by how much healthier it is compared to the classic fried popcorn dishes and how great it tastes! Start by preheating the oven to 450°F before you g put the pretzel sticks and the pecans in a food processor to blend until evenly chopped. Whisk egg whites, water, Dijon mustard, and garlic powder in a separate dish before taking the cauliflower and coating it with that mixture. Once it’s thoroughly coated, transfer the cauliflower to the pecan and pretzel mix until it is thoroughly coated. Once you’re done with coating the cauliflower, bake until it’s tender and the crust is golden, then add some salt and you’re done! Do note that this recipe also contains nuts, so this might not be good for you if you or your kid has a nut allergy! Another classic! Perfect for dinner, a snack, or when its game is on! One of the better known healthy dinner ideas, chili cheese nachos is a simple recipe to make To prepare the chili cheese, first preheat an oven to 350°F. Then cook the beef, onion, bell peppers, and garlic into a large skillet on medium-high heat, breaking the meat up with the spatula until the meat itself is brown. Next, stir in chili powder, cumin, oregano, and coriander for about 30 seconds. You will then add in water and diced tomatoes that are still fresh and juicy before letting the chili simmer for about 5 minutes. Finally, top the nachos with the chili and cheese and bake until the cheese melts. Enjoy! Note that this might not be good for lactose intolerant people due to the cheese. Meatballs are usually a good appetizer, and might not seem like a true meal to enjoy for dinner, but they can be incorporated as part of other healthy dinner ideas that you can prepare quickly and easily for you and your children to enjoy! Your kids may even want to join in on the cooking fun when kneading the meatball mixture and rolling the meat into actual meatballs. To start, mix coconut milk, soy sauce, and curry powder into a large saucepan and set them aside. Then combine either pork, beef, or both meats together with scallions, leeks, cornstarch, flour, sesame oil, ginger, chile, salt, and pepper in a large mixing bowl. Here’s the fun part of making meatballs; knead the meat mixture until it becomes slightly sticky When it sticks, you’ve now thoroughly combined all ingredients to create the perfect meatball. Take out ten equal portions of meat and roll them all into a ball before pouring olive oil into a skillet so that the meatballs can cook until brown on all sides. Boil the coconut milk mixture and then add the cooked meatballs into the mixture,closing the lid and letting it simmer for about ten minutes. You have now made the perfect healthy meatballs for you and your children to enjoy! Vegetable beef stew is a very popular dish that many make for a healthy, home-cooked meal. Though it isn’t too complicated, preparing this dish is a rather slow process and usually takes hours to cook. But stay patient! The taste is worth it, in the end. To get started, you need a slow cooker and 2 lbs. of beef. Cut the beef into one inch cubes and trim off the fat, then cook and stir the beef cubes until they are brown and remove any excess fat that you may have missed. You will then put the beef cubes into the slow cooker, along with potatoes, carrots, onions, cream of mushroom soup, beef broth, and marjoram or thyme. This dish will take quite some time to cook and simmer , ranging from a four-hour period if cooked on high heat to even nine hours if cooked on low heat. Once it’s been cooked, stir in some green beans until the green beans are tender. After that, you can sit back and enjoy the stew! You even have the option of replacing any of the vegetables in this recipe with different kinds if you want to enjoy a unique flavor. 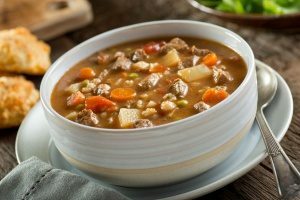 Either way, being one of the best healthy dinner ideas, the vegetable beef stew is worth the resulting healthy, delicious taste!